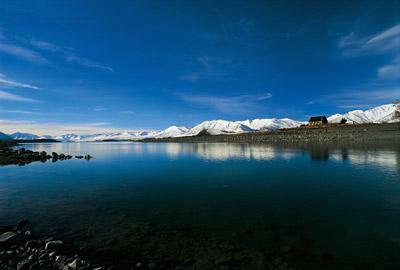 Lake Tekapo is about three hours drive south-west of Christchurch in the Mackenzie Basin. 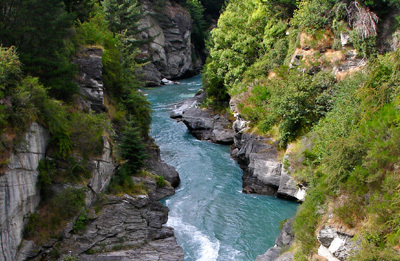 The township faces north across the remarkable turquoise coloured lake to the mountainous drama of the Southern Alps. Lake Tekapo gets its intense milky-turquoise colour from the fine rock-flour (ground by glaciers) which is suspended in the water. The first people to live in the Mackenzie Basin were Maori. They quarried stone for tools, fished for eel, hunted birds and established summer camps along the rivers and lakes. European settlers didn't really know about the area until the mid 1800s, when a Scottish shepherd named Jock Mackenzie was arrested for sheep stealing. He ventured into this high country to hide his stolen flock from the eyes of the law. On the shores on the lake you'll see the beautiful Church of the Good Shepherd, where the altar window frames a perfect view of Mount Cook. Close by is the "sheepdog monument" - a bronze statue sculpted to recognise the district's debt to the sheepdog "without the help of which the grazing of the mountainous country would be impossible". There are walking tracks following the lake shore. For huge views of the Mackenzie Basin you can hike up to Mount John Observatory (1031 metres) or Cowans Hill.